Poetry matters, and it matters that poetry should be translated and move freely across the frontiers of time and space. These are the premises on which we edit and poets and translators from all over the world contribute to MPT. This issue proves a truth we hold to be self-evident: that poetry is necessary for a humane life. Some states encourage their poets, others ignore them, others imprison and murder them. 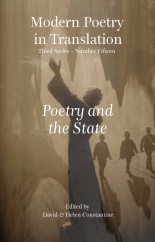 MPT 3/15 documents the varying but never easy relationship between poetry and the state. Any lyric poem, whether ‘political’ or otherwise, insisting on the value of individual experience, lives in more or less uneasy dealings with the order and the ideology of the state. Does the state allow you the autonomy the poem demands?